Everything I know about football I learned from Friday Night Lights. I still want to be Tami Taylor when I grow up. I don’t love sports that much. But I do love documentaries. 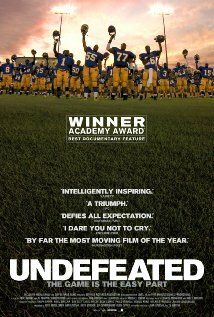 And Undefeated is one of the best sports docs I have ever seen. Brand-new to DVD/streaming, this is an incredible film. Forget FNL. Forget The Blind Side. No big names, no theatrics, no force-fed emotion. Simply the remarkably inspirational true story of the 2009 Manassas Tigers, a ragged inner city high school football team in Memphis led by volunteer head coach Bill Courtney. There are moments in this film that seem impossibly scripted. But they’re not. You may even be tempted to dismiss it as another rich-white-guy-helps-poor-black-kids story. But do not. Please see. Seriously! And restore your faith in humanity. 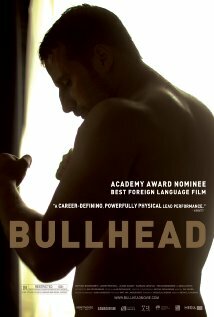 Bullhead (Belgium): The performances in this dark, deeply disturbing and testosterone-laden story of a man who endures a childhood trauma and never recovers are fierce, even though the backdrop—the cattle farming industry plagued by gangsters—is kind of weird. The plot can be hard to follow at times (it’s partly based on a real incident that occurred when a government veterinarian inspector was killed), but I found myself thinking about this movie long afterward. Goodbye First Love (France): I’m a total sucker for young love stories because they make me recall my own innocent and all-consuming experiences from a million years ago. While some people might be bored by the minutiae of the affair (this is a very French film), I was hooked on the young girl’s attempts to finally move past the relationship and grow into a new person. I also secretly hoped the two lovers would find happiness together again. 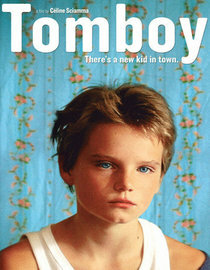 Tomboy (France): One of the most thought-provoking films of last year is about a 10-year-old girl who identifies as a boy, dressing and acting like one (without her parents’ knowledge) when they move to a new town. The child actors do an amazing job—at times I felt like I was watching a documentary. Anyone who doesn’t “get” the issues surrounding gender identity should see this film; it’s impossible not to empathize with the girl’s confusion and struggle for acceptance. I streamed two very good films on Netflix last weekend. Finally streamed Page One: Inside the New York Times, one of the more interesting documentaries I’ve seen in a while. It’s not without its flaws–disjointed in parts and lacking explanation in others. Still, I’d recommend it to anyone who cares about the media even a little. An examination of the journalistic landscape in the face of the Internet, the film offers unprecedented access to the NYT‘s Media Desk, as reporters and editors navigate the paper’s response to—and responsibility in—the digital age. Appearances by David Carr (he’s sort of weirdly positioned as the hero), Bruce Headlam, Brian Stelter and more. It thought-provokingly juxtaposes traditional, institutionalized legacy reporting with Twitter, blogs and aggregate sites, while reminding us that publishing is a business—one we hope the Times survives. And just because it’s fun (although not very flattering), here’s the NYT review of its own movie. Get ready to get sad—Roadie looks like that kind of movie.